Seven Big 12 teams made the 2018 NCAA Tournament. Four of them survived the first weekend. Here are seven things I learned while watching the Madness. Apparently there was a line of demarcation in the Big 12 this season. 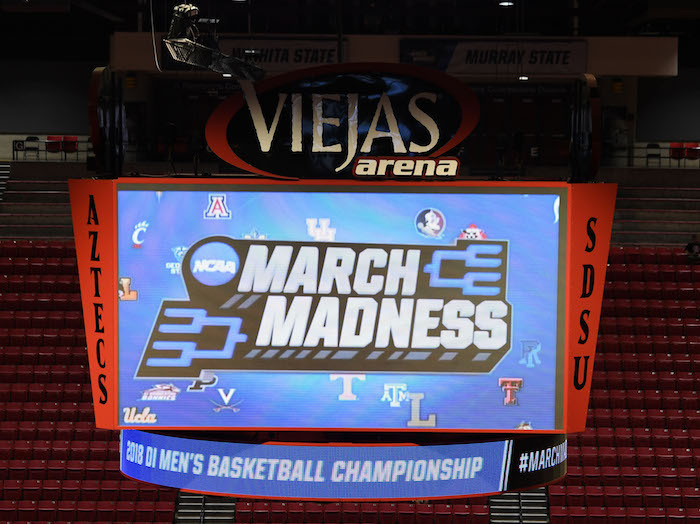 The top four teams in the final Big 12 standings — Kansas, Texas Tech, West Virginia and Kansas State — all moved into the Sweet 16. TCU, Texas and Oklahoma didn’t make it out of the first round. If there was any good news it appeared the rigors of Big 12 action more than prepared these seven teams for the tournament. None of the Big 12’s three losses turned into a blowout, while Texas and Oklahoma lost in overtime. The Big 12 is tied with the ACC with four teams in the Sweet 16, and by far, the highest percentage of its conference (40%) left in the Big Dance. Overall, the conference finished the weekend 8-3. Kansas State ended up with the best draw. Of course, the Wildcats’ No. 8 seed had nothing to do with it. The Wildcats had the great fortune to end up opposite Virginia in the South Region when the Cavaliers fell to Maryland-Baltimore County, 74-54, as the UMBC Retrievers became the first No. 16 seed to upset a No. 1 seed in the men’s tournament. Still, the Wildcats were down their All-Big 12 First Team forward, Dean Wade, who missed the weekend with a stress fracture in his foot. So, the Wildcats picked a good time to get gritty and explore their depth. Guard Barry Brown Jr. led the way, of course. But, Kamau Stokes, Xavier Sneed and Cartier Diarra all came up big at various times (or did you miss Sneed’s rebound and slam late against the Terriers which seemed to seal the deal?). But don’t forget about Mark McGuirl, who came off the bench in the first round against Creighton to score 17 points in 22 minutes. Sunday’s second-round win wasn’t pretty basketball by either team, but the point is to survive and advance, and that’s what the Wildcats did. Now, suddenly, their bracket is wide open, as the South Region is the first region ever to see the top four seeds fail to reach the Sweet 16. K-State gets Kentucky next, with Loyola of Chicago and Nevada on the other side of the bracket. I think Wildcat fans would feel much better if Wade could play. But there is an opportunity to do something special now. I think Texas Tech can get into the Elite Eight. I had the benefit of attending the sub-regional in Dallas and here are a few things that I learned. First, I think Keenan Evans is fully out of the danger zone when it comes to his toe. I saw him drive to the basket hard late in both games against Stephen F. Austin and Florida. Because the sub-regional ended on Saturday and the East Regional doesn’t start until Friday, he gets an extra day of rest. 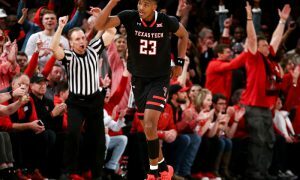 Second, the freshmen, Zhaire Smith and Jarrett Culver, got a taste of the tournament and by Saturday any jitters they might have had were gone. Culver had a much better game against Florida than he did against SFA, and as for Smith, well, his exclamation mark at the end belied a sublime 18-point performance. Third, Zach Smith may be ready to play a larger role. He played 22 minutes, scored 6 points and grabbed 3 rebounds. 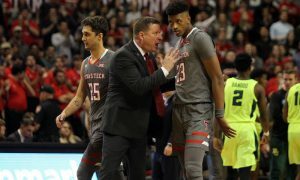 He brought some energy to the floor that I had not seen from him since he returned from his injury and that’s encouraging for Chris Beard’s rotation. Tech gets Purdue next, and the Boilermakers are trying to find a way to get their big man, Isaac Haas, back on the floor after he fractured his elbow in the first round. The brace the Boilermakers made to help him protect the fracture was not approved by the NCAA, so he didn’t play in Purdue’s three-point win over Butler on Sunday. Haas is hoping that a few days of rest can cut down on the inflammation of his elbow. But it’s unlikely he’ll play. 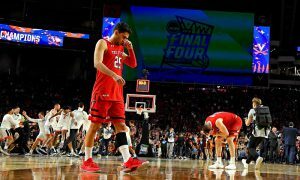 The Red Raiders have the skill to beat Purdue, and that would lead to a potential meeting with Villanova or — gasp — West Virginia. Nothing is shaking Tech’s confidence at this point. The Red Raiders face two brutal tests against SFA and Florida and survived them both. They can do it again this weekend in Boston. I see a blueblood Midwest Regional final in Omaha, Nebraska. Yep, I think you’ll see Kansas and Duke playing for a spot in the Final Four next Sunday. The return of Udoka Azubuike certainly helps, and his 22 minutes against Seton Hall may have looked a bit underwhelming (10 points, 7 rebounds), but Kansas coach Bill Self credited Azubuike’s return with the win. That’s because Seton Hall’s Angel Delgado spent the game impressing every NBA scout in the building with 24 points and 23 rebounds. And, yet, Kansas survived. The Jayhawks did so because Malik Newman is on the hot streak of his life (28 points against Seton Hall) and now that Azubuike is back Kansas can settle back into its normal rotation. I think Kansas finds a way to beat Clemson, which destroyed Auburn and is probably poised for a letdown, before catching Duke in the final. And that will be something. West Virginia left no doubt they’re ready to challenge Villanova. I had some concerns about the Mountaineers having to go all the way to San Diego for their sub-regional. Apparently jet lag doesn’t affect Mountaineers. They dispatched of Murray State in the first round by 17 points and then took care of in-state rival Marshall by 23 points. The focal point of both wins was guard Jevon Carter (21 points, 8 assists, 6 steals vs. Murray State and 28 points, 5 assists and 5 steals vs. Marshall). The senior is on a mission to get the Mountaineers as far as he can get them and, complemented by Daxter Miles, Sagaba Konate, Esa Ahmad and the rest of the team, they may be playing the best basketball of any Big 12 team entering the Sweet 16. That matchup between Carter and Villanova guard Jalen Brunson, considered by some to be the best guard in the nation, is going to be epic. Don’t miss it. At least it’s a little closer to home in Boston. Texas and Oklahoma are off to do some soul-searching. But for different reasons. Texas may lose Mo Bamba, but if things fall right the Longhorns could return nine of their Top 10 scorers from this season in 2018-19 (and if Bamba surprises us by returning then it’s all 10 leading scorers). Plus, head coach Shaka Smart has another fine recruiting class coming in, and that includes a pair of Top 2 recruits in their respective states. So, Texas has talent. But it’s time for Smart to start putting the ingredients together, especially in March. As for the Sooners, they’re in limbo until Trae Young decides on his future (most believe he’ll take a shot at the NBA, though his father would love to see him play in Norman another year). If Young stays, then the Sooners should be a solid team. If he goes, well, there are real problems in Norman because the talent around Young doesn’t look like enough to keep the Sooners above .500. Plus, because just one senior is leaving, the Sooners don’t have many scholarships to recruit on. Either way, the Sooners are counting huge on player development this offseason. TCU isn’t going anywhere. The days of TCU being a doormat are done. In Year 1 head coach Jamie Dixon took the Horned Frogs to an NIT title. In Year 2 Dixon got the Horned Frogs into the NCAA Tournament and had a chance to beat Syracuse. The Horned Frogs are losing some key seniors (and you can read more below), but between the returning talent and Dixon’s well-regarding two recruiting classes, 2018-19 could be a year where TCU takes another step and starts consistently challenging to be in the Big 12’s upper echelon.